Can Arabs, who make up one-fifth of Israel's population, be loyal citizens of the Jewish state? With this question in mind, I recently visited several Arab-inhabited regions of Israel (Jaffa, Baqa al-Gharbiya, Umm al-Fahm, Haifa, Acre, Nazareth, the Golan Heights, Jerusalem) and held discussions with mainstream Arab and Jewish Israelis. 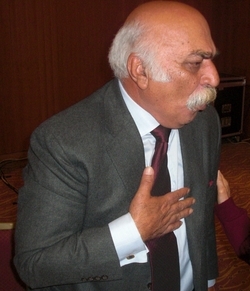 Ali Yahya, former Israeli ambassador to Greece and Finland. I found most Arabic-speaking citizens to be intensely conflicted about living in a Jewish polity. On the one hand, they resent Judaism as the country's privileged religion, the Law of Return that permits only Jews to immigrate at will, Hebrew as the primary language of state, the Star of David in the flag, and mention of the "Jewish soul" in the anthem. On the other hand, they appreciate the country's economic success, standard of health care, rule of law, and functioning democracy. These conflicts find many expressions. The small, uneducated, and defeated Israeli Arab population of 1949 has grown ten-fold, acquired modern skills, and recovered its confidence. Some from this community have acquired positions of prestige and responsibility, including Supreme Court Justice Salim Joubran, former ambassador Ali Yahya, former government minister Raleb Majadele, and journalist Khaled Abu Toameh. But these assimilated few pale beside the discontented masses who identify with Land Day, Nakba Day, and the Future Vision report. Revealingly, most Israeli Arab parliamentarians, such as Ahmed Tibi and Haneen Zuabi, are hotheads spewing rank anti-Zionism. Israeli Arabs have increasingly resorted to violence against their Jewish co-nationals. Indeed, Israeli Arabs live two paradoxes. Although they suffer discrimination within Israel, they enjoy more rights and greater stability than any Arab populace living in their own sovereign countries (think Egypt or Syria). Second, they hold citizenship in a country that their fellow Arabs malign and threaten with annihilation. My conversations in Israel led me to conclude that these complexities impede robust discussion, by Jews and Arabs alike, of the full implications of Israeli Arabs' anomalous existence. Extremist parliamentarians and violent youth get dismissed as an unrepresentative fringe. Instead, one hears that if only Israeli Arabs received more respect and more municipal aid from the central government, current discontents would be eased; that one must distinguish between (the good) Arabs of Israel and (the bad) Arabs in the West Bank and Gaza; and a warning that Israeli Arabs will metastasize into Palestinians unless Israel treats them better. 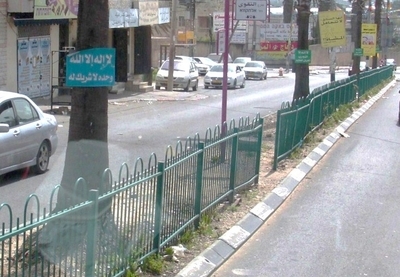 Religious signs along a main street in Baqa al-Gharbiya. This avoidance reminded me of Turkey before 2002, when mainstream Turks assumed that Atatürk's revolution was permanent and assumed Islamists would remain a fringe phenomenon. They proved very wrong: a decade after Islamists democratically rode to power in late 2002, the elected government steadily applied more Islamic laws and built a neo-Ottoman regional power. I predict a similar evolution in Israel, as Israeli Arab paradoxes grow more acute. Muslim citizens of Israel will continue to grow in numbers, skills, and confidence, becoming simultaneously more integral to the country's life and more ambitious to throw off Jewish sovereignty. This suggests that as Israel overcomes external threats, Israeli Arabs will emerge as an ever-greater concern. Indeed, I predict they represent the ultimate obstacle to establishing the Jewish homeland anticipated by Theodor Herzl and Lord Balfour. 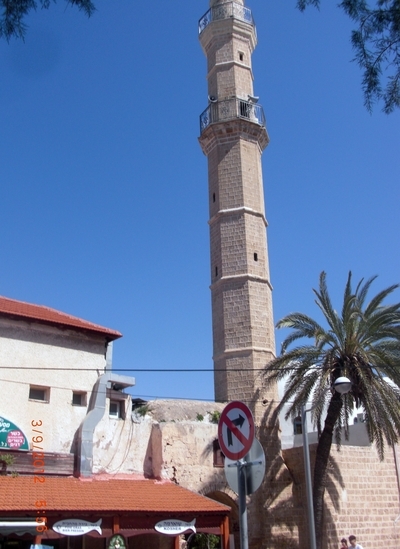 Kosher sign below, minaret above in Jaffa. What can be done? Lebanon's Christians lost power because they incorporated too many Muslims and became too small a proportion of the country's population to rule it. Recalling this lesson, Israel's identity and security require minimizing the number of Arab citizens – not by reducing their democratic rights, much less by deporting them, but by such steps as adjusting Israel's borders, building fences along the frontiers, implementing stringent family reunification policies, changing pro-natalist policies, and carefully scrutinizing refugee applications. Ironically, the greatest impediment to these actions will be that most Israeli Arabs emphatically wish to remain disloyal citizens of the Jewish state (as opposed to loyal citizens of a Palestinian state). Further, many other Middle Eastern Muslims aspire to become Israelis (a phenomenon I call Muslim aliyah). These preferences, I predict, will stymie the government of Israel, which will not develop adequate responses, thereby turning today's relative quiet into tomorrow's crisis. Apr. 11, 2012 update: Ha'aretz opened its pages to Carl Perkal, a self-described "documentary film producer and media consultant living in Israel." to attack this column in "Daniel Pipes' attack on Israeli Arabs is baseless and inflammatory." I am accused of writing "an aggressive and confused jumble of half-truths and misunderstandings about the Arabs citizens of Israel." Trouble is, I barely recognize what I wrote in Perkal's "baseless and inflammatory" attack on me. So, I won't respond to it. Apr. 22, 2012 update: Happily, Ariel Solomon replied to Perkal today in the Times of Israel, in "Haaretz Publishes Spurious Attack Against Daniel Pipes." Solomon comments there that "In his delusional piece, Perkal makes a number of erroneous arguments, writing as if he did not actually read Pipes's article." Precisely. May 15, 2012 update: Perkal goes another round at "A Reply to Ariel Solomon," where he disagrees with many specifics and concludes rather grandly by advising Solomon to "respond to the bigger picture as I have presented it both here and in my previous article. The fate of Israel may well depend on it." Oct. 29, 2012 update: I further pursue this topic in an occasional weblog entry, "Updates on the Israeli Arab Paradox." Related Topics: Israel & Zionism, Palestinians | Daniel Pipes receive the latest by email: subscribe to the free mef mailing list This text may be reposted or forwarded so long as it is presented as an integral whole with complete and accurate information provided about its author, date, place of publication, and original URL.